When cutting a thick substrate, cutting start or end position may be overcut, depending on the edge shape. 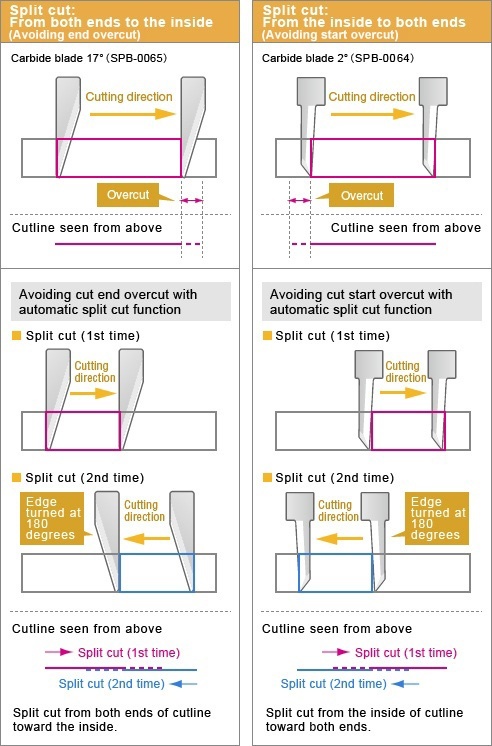 Therefore, FineCut8 can prevent substrates overcut by splitting automatically the cutline to control cutting in 2 steps from both ends of the cutline to the inside or from the inside to both ends. Cutting starting position can be specified according to the shape of the object. When starting to cut a thick substrate, it tends to fluff. Specifying the cutting start position on the corner of the object can prevent fluffing. Starting cut from a less conspicuous point can lead to higher quality finish. Layer division of printing data and cutting data can be performed by easy operation. Useful news such as the latest information and update in formation of FineCut will be provided by Web. Information will be displayed when Illustrator is started or the "i button" in FineCut menu is clicked. * This screen is displayed only in English or Japanese. List The list of FineCut information is displayed. Click to display the information on the bottom column of Outline. Double-click to display the detailed information on Web browser. Check Put a check if the information is checked. Checked items are not displayed when starting Illustrator next time. Release Date It is the released date of the information. Topics It is an outline of the information. Description Details: The details of the information selected above is displayed. URL: Click to display the detailed information on Web browser. This screen is not displayed when unconnected to Internet. For Macintosh, it is displayed on Mac OS X 10.4 or later. "Trace Simply" screen enables you to create the outline more easily. *The same can be performed on CorelDRAW as well. "Connection test" is added in order to check the cause of communication error so quickly. This function joins paths that are separated into several lines while reading DXF data, avoids unnecessary head-up for cutting, and finishes the cutting surface finely. Before starting to cut, start position, the cutting line, cut direction and cutting order, etc can be checked. This function ensures proper cutting. Also if necessary, you can change the conditions. Cutting conditions with endmill can be set from FineCut. When cutting is close to the last part the pass to be cut, the spinning endmill may push the part of the material, so that the last cut part can be shifted and can not be cut smoothly. To prevent this, the last part of the pass is not cut in full to keep the material from shifting. This is done at a last stage cutting with low force for a smooth final cut. FineCut7.6 can also set the joint on multiple positions. This function finishes the cutting surface finely, even with a long-path object or with a flexible media. In order to reuse the data made by other company's software or plot data in the past, it reads the plot data with CorelDRAW and Illustrator and can plot via FineCut using the original data. By making spline approximation outputting of Bezie Curve, the head moves at a constant speed and can cut smoothly even at a connecting parts of lines. 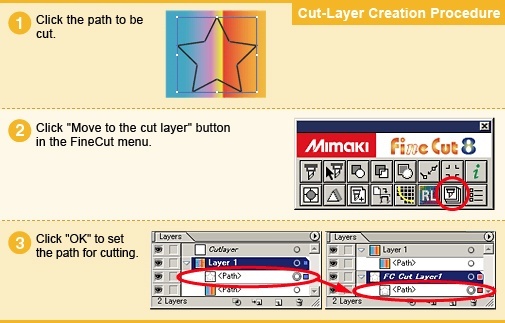 Setting the tool and cutting conditions, the order of cutting can be changed freely within a color or a layer by dragging of the mouse. The cutting is made smoothly coordinated with the features of the tool and the cutting shape to make the beautiful finish. When a hard material or thick material is cut with CF and CF2, it happens that it cannot be cut at one try. By setting the number of cutting times, speed and pressure, etc. for one cut line, FineCut7 is able to cut hard material or thick material by cutting multiple times. This is a function to extract automatically outline of the image data having no path such as image of BMP, JPEG and TIFF read with CorelDRAW and Illustrator. Cut line can be created easily from the image data which could not be created up to now. By correcting the outline extracted by "Outline extraction", it is possible to refine it to the data with higher accuracy. With "Line segment correction tool", you can correct easily and sensuously. ■Direct and simple cutting using data from CorelDRAW. ■With the use of "import" or "export" of cutting conditions, the cutting conditions can be stored for reuse. ■The tiling function makes it possible to perform divisional cutting of lengthy material. ■The trapping function makes it possible to set the overlap space easily.